Craft Beers have been soaring up the popularity charts among beer drinkers in the US and UK over the last couple of years and Liberation Brewery in Jersey is proving to be at the forefront of this trend with the launch of its own version, Liberation Blonde Craft Beer. Brewed using quality ingredients to ensure a fuller flavour, Craft Beers are part of a recent renaissance in brewing that has seen the large multi-national global giants which have dominated beer in the last few decades begin to decline, in favour of breweries which produce locally brewed beers with a passion. Craft Beer is a different offering for Liberation Brewery who are well known for their real ales. However, they are confident the new tipple will prove popular with customers and hope to be able to offer some of their other beers as Craft Beers in the not so distant future. 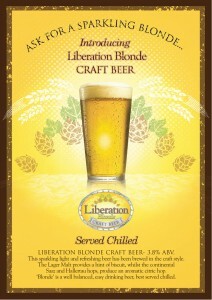 Liberation Blonde is the Longueville-based brewery’s first foray into carbonated beer for a very long time. Blonde sparkling beers are light and refreshing, chilled and served straight from the keg, with a close resemblance to lager but with all the flavour of real ale. Liberation Brewery’s Blonde is created using lager malt, which provides a hint of biscuit with an aromatic citric hop arising from the blend of Saaz and Hallertau varieties and is available at the St Mary’s Country Inn and The Bar and Canteen.